I highly suggest using a more modern browser, like Chrome or FireFox instead of this browser. HazteK MultiBrowse was created for people that browse web forums. It lets you load two or more pages at once, that way you can drag links from one browser window into another, and never have to use the back and forward buttons. 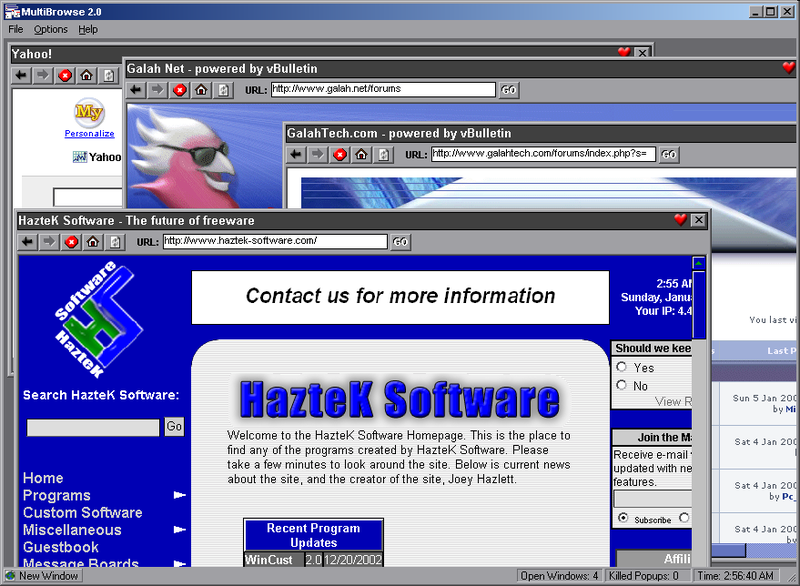 It works like a normal browser, based on the Internet Explorer engine. It’s not the world’s most innovative program, but it sure is helpful. MultiBrowse requires the Visual Basic runtime files. If you run Windows 2000/XP/2003, you should have them already. You will also need the mscomctl.ocx file. Visit the dependencies page. *infinte based on the amount of RAM and hard drive space your PC has. What do you think about MultiBrowse? Rate it!